Do you feel like you’re always falling behind, constantly overwhelmed with juggling too much, in a never-ending search for a system that works? 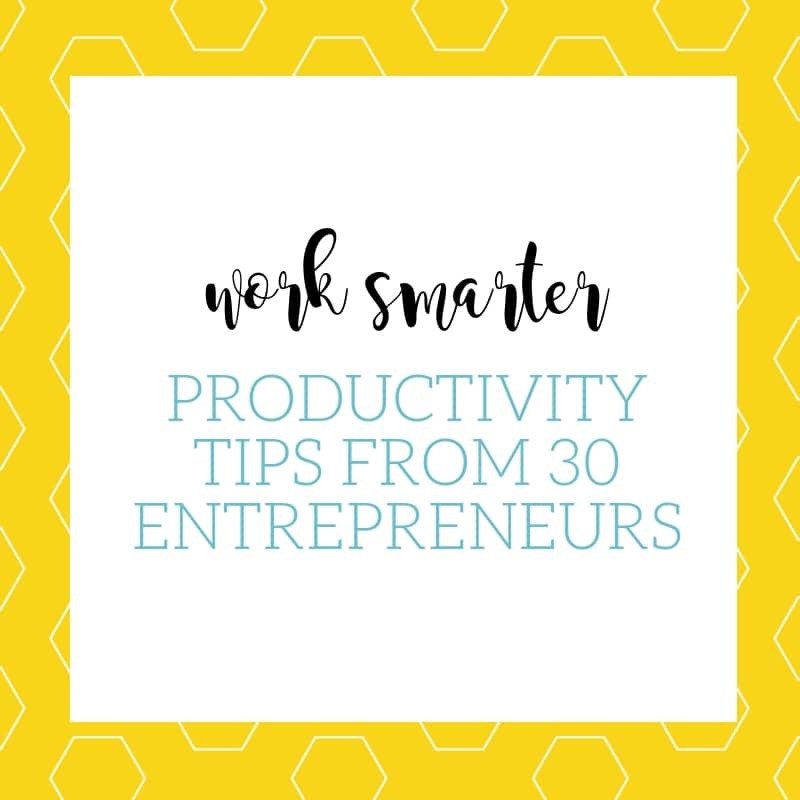 Start making positive changes using these smart productivity tips from a diverse group of 30 women entrepreneurs. Whether you’ve just launched your business or have been at it for more than a decade like me, productivity is likely something you think about a lot. After all, the key to increasing your income is to finish more work in less time. Even if you charge by the hour, chances are you’d like to streamline your workload to feel more organized and less stressed, and to free up time for unpaid business and marketing tasks. Some of these productivity tips may seem obvious (yet many of us fail to do them), while others may have you completely reexamining how you work. Incorporate those that make the most sense for you, and get ready to maximize your time to save hours and feel better about what you accomplish each day. Prioritize sleep. We might attempt to get more done, but instead we do a haphazard job at a speed slightly slower than our arch nemesis. To get more done faster, avoid burn out and leave time for a life. Every morning, I write down my goal for the month 10 times and my beliefs around what I can do in my business. This helps me stay on track and, remain focused, and not get overwhelmed. Take care of yourself first. If you don’t make yourself feel good, (for me, it’s hair done, a bit of mascara, and no chips in my nail polish), then it’s a lot more likely you are going to not feel good about a whole lot. Make time for your needs and wants and I promise things will fall into place when it comes to being productive. Eating well and maintaining order in your home can easily become casualties when productivity ramps up in your professional life. And nestled at the intersection of nutrition and household management, we find meal planning. None of us ever feels like systematizing our lives at this level, but we can all benefit from taking a brutally honest assessment of how much time and energy we have to dedicate to fueling our bodies for the hard work we do. Schedule “me time.” Set a weekly appointment with yourself dedicated to doing whatever relaxes you. Resting is a form of self-investment, just like the online courses that you spend money and time on. If you continuously overwork yourself, you’ll lose motivation, creativity, and focus, which will cause you to waste more time. When I’m struggling to be productive I look at why. Sometimes I procrastinate because I don’t want to do something and other times it’s because I really need a break. If I’m doing everything but the thing I’m supposed to be doing, then I’m just avoiding that task so I figure out the smallest thing I can do to gain some momentum. If I find myself not wanting to do anything, then I need a break so I’ll take a drive, watch crappy TV, or take a nap to clear my head. Lists, lists, and more lists! I have lists for personal use (meal planning, cleaning) and lists for my business (social media scheduling, daily and monthly checklists). I keep them where I’m sure to see them and I love being able to check things off as I complete them. My tip is to use multiple to-do lists. I know it sounds disorganized, but hear me out! Write up to-do lists for different categories (mine include “to make,” “to learn” and “to do”). When I get sick of one list, I switch to another. I’m still being productive and ticking things off, which feels great, but I also feel like I’m taking a break. When I’m lacking motivation yet need to be productive, I find the least intimidating that’s the easiest to complete on my to-do list. Once I can complete one thing and feel that sense of accomplishment, it gets the ball rolling and I can move on to another task. Use different colored highlighters to organize top priority items from those that are of secondary importance, or arrange them in order of importance. The visual aspect will help you to stay on track so you don’t have to constantly consult your to-do list as you go about your day! Making weekly to-do lists helps me focus and prioritize what needs to get done. I don’t type the lists out or put them in my phone—I hand write them. There is something about the act of physically crossing things off on a piece of paper that feels like a greater accomplishment than deleting the task on a computer or your phone. Having a system in place that works is essential for me. The longer you need to spend figure out what it is that you need to do next, the more time you’re wasting. A smoothly-functioning system eliminates all of the questions and allows you to be not just productive, but consistent. Turn off your email. Seriously! Use Boomerang or Inbox Pause to disconnect fully and only check email a few times a day. Your clients and family members will get used to the fact that you’re not tethered to email. Try this for two days and see if you don’t have some of the most focused, productive work periods of your life. Kanban Boards are one of my favorite ways to stay organized and productive! I created a sticky note chart with three categories—to do, in progress, and done. In the to-do category I prioritize my tasks from most important to least important. I’m careful to not have too many tasks in progress to prevent burnout. Kanban Boards are great for visual people, like myself, to be able to see their progress in action. There are two tools I love to use. Wunderlist is a to-do list and reminder tool for tracking things you need to do as well as projects and errands. Evernote is pretty much a standard now, right? I love it for clipping articles from my web browser as organizing project notes. Sign up for Asana. Asana is a productivity tracker for teams or individuals, and it will absolutely change the way your organize and maintain your blog admin and marketing tasks. Asana is really easy to learn, super versatile, and—best of all—free. I set an automatic timer on my computer to ring every hour or so. Each time it rings, I consult my planner with my list of stated priorities and intentions for the day. If I’m doing something that isn’t the next item on my priority list, I re-route myself to staying on task. RescueTime was a game changer for me. It lets me see exactly what I’ve been up to online, pretty much to the minute. This is helpful for the reality checks about how much time you’re wasting, but it’s especially helpful for starting to understand organically how long certain parts of your job actually take, without having to mess with a stopwatch every few minutes. It’s really helped me reorganize and streamline my days. The Pomodoro technique sounds scary, and I was really resistant, but it has totally changed my productivity. First, I block out a few hours to work on a certain aspect of my business, such as content creation. Then, I work only on one thing for 25 minutes, and then take a 5-minute break. I usually do three sets before taking a longer break. Total game-changer. I struggle with holding myself accountable, which means I often procrastinate and fall behind on work. My mastermind group helps me with that issue because I know each week a group of amazing bosses is going to ask whether I accomplished my goals. It really keeps me on task between meetings. Working with a coach definitely boosts my productivity. I’ve found that when my productivity wanes, it’s typically because I’m not feeling good enough or smart enough or experienced enough for whatever tasks are on my to-do list. My coach helps to dissect the issue down while calling forth those inner “enough” saboteurs so I can handle them and then get back to work! I leave my coaching sessions with a renewed energy, enthusiasm and focus for what I need to (and want to) do. Each night before bed list the top three things you need to get done the next day. In the morning, prioritize your day according to the top three. This works best when combined with not checking email for the first 90 minutes of your day. Your email is other people’s priorities (the new O.P.P. ), and can derail your day by sending you down the rabbit hole of stuff other people want you to do. Put it in your calendar. I schedule everything in my calendar in 30-minute increments (blog posting, returning clients’ emails, etc.). If it doesn’t get into my calendar, it doesn’t get done. Take 5 to 10 minutes to write down everything you think you need to do for the day. Schedule those that are most important within your calendar and set reminders for when to start Pomodoros for each. This simple strategy has allowed me to accomplish more than I planned. How do you attack your goals?? To increase productivity implement a little structure, why not try reverse engineering your schedule. Take your end goal or your biggest deadline and work backwards. Think of the tiniest step immediately before the goal and go from there. Think going from 10 to 9.9 to 9.8 …Not only will it all feel a bit more manageable, you’re much less likely to forget the little things. I work in 13-week cycles and design goals within this time frame. I found that stretching out to longer time frames (6-12 months) weren’t actionable enough. To reach my 13-week goals I break steps into weekly goals and then to daily implementation tactics. It has done wonders to take big ideas and make them achievable. Chunk tasks into groups and schedule them into your calendar. For instance, block a 2-hour time slot to work on blogs. The important thing is to physically slot tasks into your calendar. I work in time blocks. Time blocking helps me to focus 100 percent on what I’m doing, and it’s much easier to schedule out my day. Also, it’s not too restricting. As a creative entrepreneur, I’ve noticed that using any strict regulations tend to mess with the quality of my work. Focus on just the next step, one step at the time. Let’s say you have a big goal for the next two months. If you only focus on the big goal, you might end up procrastination or being unproductive. You’ve got to get clear on the different steps to your goal. And translate those in small tasks. Then schedule the small tasks on your calendar and focus only on them. It takes away the overwhelm and every step is clearly getting you closer to your goal. My best tip for being more productive is finding a time that works for you. I work random hours of the day because I cater to my kids’ school schedules, but I’ve learned that morning is when I’m the most productive. Instead of running errands early, now I do them later and crank out a ton of work in the morning. Thanks for helping out with the post! Great tips! I need that this morning!! Thanks, Rachel. I’m glad it’s helpful to you! I am bookmarking this to come back to it later! I am a huge list maker and that definitely helps me stay on track! Thanks for reading and bookmarking. Do come back. I know I’ll have to check back on this list often because there are just so many great ideas! Great tips! I will be using these! Thanks for reading, Taylor. I’m glad you found the tips useful. It definitely took some time to pull together, but I’m so pleased with the results. There’s always something more powerful about the collective wisdom! Thanks for reading. What an awesome post! Love all your tips! To be fair, only one tip was mine — this was an amazing collaborative effort and that’s what I really love about it. So glad you enjoyed! These tips are awesome! Bookmarking this post to remind myself of all your great advice. Thank you! Thanks, Sophia! Glad you found it useful and definitely recommend returning to review. It is so important to take a few extra minutes to meet your personal needs before tackling your biz. responsibilities! You can’t pour from an empty cup! I’m so guilty of not doing a good job of this, Shirah, but you are very correct. Self care is essential to productivity. Thanks for reading. Great advice! I love the fact that you start with self-care. Most of us tend to get this backwards – including me. Thank you for reading! I probably started with self-care because I know it’s the one that I need to focus on most. Maybe we all do. A ton of great tips here! Thank you for sharing the encouragement. I need to get back to focusing on my goals and the big picture each day! Thanks, Lori, for stopping by. I’m glad you got some value from the post! Wow, a ton of valuable tips here. What helps me be productive is always having my music playing and a cup of coffee. Music truly is my muse and work is simply not the same without it! Love the music tip! I listen to podcasts unless I really need to focus and then music is a great help. Thanks for the comment. While I do my work when the time is right for me, I still struggle with productivity (like, all the time). So these tips are gold! Focus is huge for me. It’s nice to see time blocking on here. It’s something I’ve been wanting to implement. Thank YOU for participating! I’m glad you found value in the other tips. I know I did. I can’t wait to do more of these types of roundup posts. While I like sharing my knowledge, I really love being able to share the collective wisdom because I think it’s so much more valuable. I’ll have to check out that podcast, thanks for sharing! So glad you found the post useful, Linda. Thank you for your tip! Useful stuff. I’ve just implemented a strategy of taking a break after completing a “significant task” (that’s a deliberately vague term). Too soon to see if it provides results long-term but I’ve been experimenting with different approaches to productivity recently and I think the trick is to find the best method for your personality. Also going for a walk when motivation or energy drops works well for me.